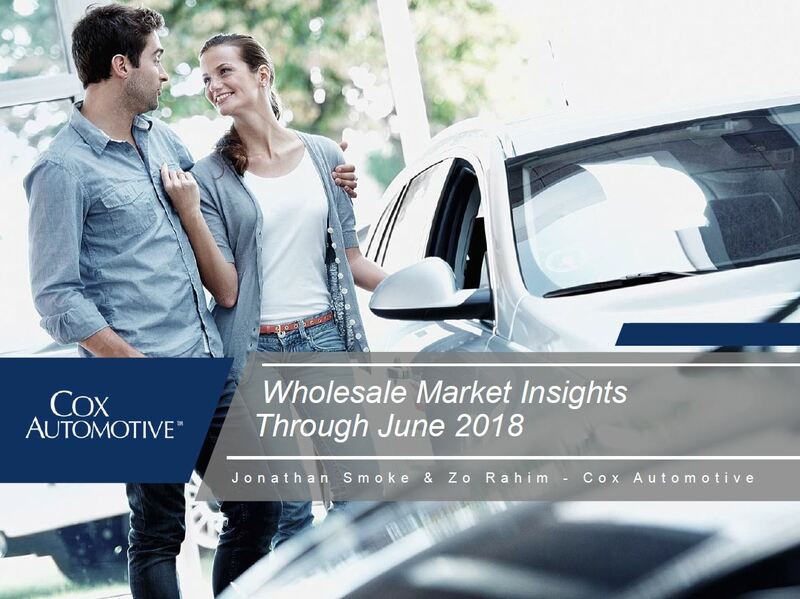 Manheim Used Vehicle Value Index (through June 2018) - Cox Automotive Inc. According to Cox Automotive estimates, used vehicle sales volume increased by 2% year-over-year in June. The annualized pace of used vehicle sales is up 1% over last year. We estimate the June used SAAR to be 39.8 million, up on a month-over-month basis. The average price for rental risk units sold at auction in June was up 7% year-over-year. Rental risk prices were down 1% compared to May. Average mileage for rental risk units in June (at 42,700 miles) was up 5% compared to a year ago but down 1% month-over-month. Consumer confidence declined in June as optimism about the economy and income growth declined, but it is important to note that consumer confidence remains higher than last year and near a 17-year high. Wholesale used vehicle prices (on a mix-, mileage-, and seasonally adjusted basis) increased 0.53% month-over-month in June. This brought the Manheim Used Vehicle Value Index to 134.9, which was a 4.3% increase from a year ago and the highest level since last October. Looking at trends in weekly Manheim Market Report (MMR) prices, the traditional spring bounce this year started three weeks later and peaked in April in week 15. Used vehicle prices had been moving down since that April peak, but that trend took a surprising turn in the last two weeks of June. As a result, prices remain higher now compared to where they were at the beginning of the year than any of the last three years. Price comparisons to last year are starting to get tougher, but this recent increase regained some ground to keep current price performance ahead of last year. On a year-over-year basis, all major market segments except luxury cars saw price gains in June. Compact cars, midsize cars, and SUVs/CUVs outperformed the overall market, while vans and pickups underperformed the overall market. Positive results for vehicle sales in June. According to Cox Automotive estimates, used vehicle sales volume increased by 2% year-over-year in June. The annualized pace of used vehicle sales is up 1% over last year. We estimate the June used SAAR to be 39.8 million, up on a month-over-month basis. June new vehicle sales increased 5% year-over-year, with one more selling day compared to June 2017. June SAAR came in at 17.4 million, up from last year’s 16.6 million. The new vehicle SAAR has come in at 17.0 million or higher five out of six months so far this year. Cars continue to see sharp declines as sales in June fell 7% compared to last year. Light trucks outperformed cars in June and were up 12% year-over-year. Combined rental, commercial, and government purchases of new vehicles were up 10% year-over-year in June, led by increases in commercial (+8%), rental (+11%), and government (+10%) fleet channels. New vehicle inventories came in under 4 million units for the second consecutive month. Rental risk pricing strengthens. The average price for rental risk units sold at auction in June was up 7% year-over-year. Rental risk prices were down 1% compared to May. Average mileage for rental risk units in June (at 42,700 miles) was up 5% compared to a year ago but down 1% month-over-month. Continued strong economic momentum. The economy grew 2% in the first quarter, which was a bit softer than originally estimated. The second quarter will see a strong rebound and will likely hit the peak in economic growth for the year. Consumer confidence declined in June as optimism about the economy and income growth declined, but it is important to note that consumer confidence remains higher than last year and near a 17-year high. See additional wholesale market insights through June 2018.